I’m realizing that philosophy podcasts are an excellent source of inspiration for comics. Today’s comic is inspired by first episode of the relatively new podcast SpaceTimeMind, with philosophers Pete Mandik and Richard Brown, which I recommend checking out. 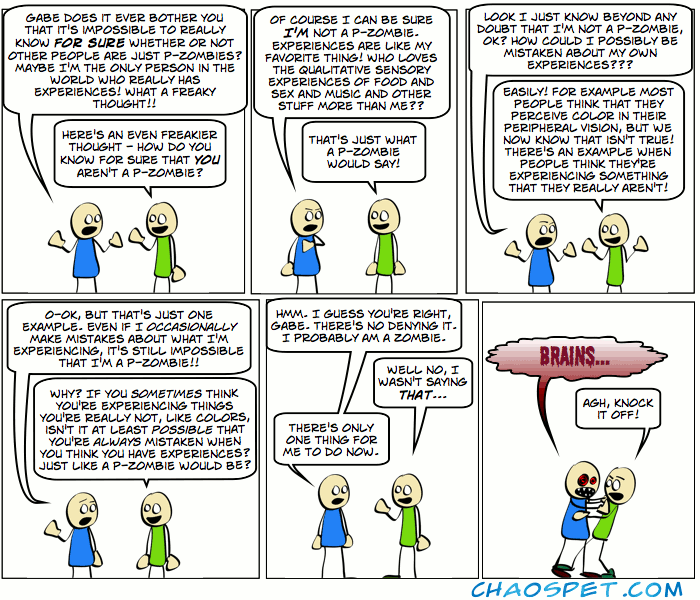 Of course I am assuming here that my readers are familiar with the notion of p-zombies (or philosophical zombies). In case you’re not, this old comic might help. I should also mention that the comic was partially inspired by Ben (I’ll link to his blog here, even though he hasn’t updated it in almost two years) who mentioned how fantastic it would be if our friend Mark (who you may remember from guest comics, see here and here), a great lover of sensory experiences, turned out to be a p-zombie. Finally, so long as I am plugging things – if you like metal, you might want to check out my good friend Noel’s band Korpsik, which just released a new album. Here’s a video of theirs, a touching ode to faith. Nice job! (Gabe represents my views perfectly.) Thanks for the shout out for the podcast!! Thanks, Pete! Hopefully Richard won’t be too offended at Nester’s attempt to defend his views. I’m enjoying the podcast a lot so far, looking forward to listening to more! I don’t recall them talking specifically about that paper (though maybe I’m just forgetting), but in any case, that is pretty excellent! Wait, is that really true? About the no color experience in peripheral vision thing? How do we know that? You can actually test this claim for yourself pretty easily! Eric Schwitzgebel’s blog explains how here (thanks to SpaceTimeMind’s twitter feed for the pointer). I have to say that when I tried it, I was pretty surprised at just how narrow my field of color perception really is. We didn’t have that Dretske paper in mind during the discussion. At least, not consciously. But It’s a great paper and I’m happy to be reminded of it. I’ll add a link to it in the episode’s notes page.